Allie Howard (left) and Maddy Clifford want to provide healing through music. They met through a feminist radio show. In 2015, Allie Howard (aka XOA, FR333's producer) was listening along to KPFA's "Women's Magazine" when she heard Maddy Clifford (aka Madlines, FR333's vocalist) discussing her work. Howard decided to shoot her an email. Before long, the two met and FR333 was born. For Howard, too, it was the first time she was able to move from working solo in production and sound design to building a community around collaborating with other women musicians. 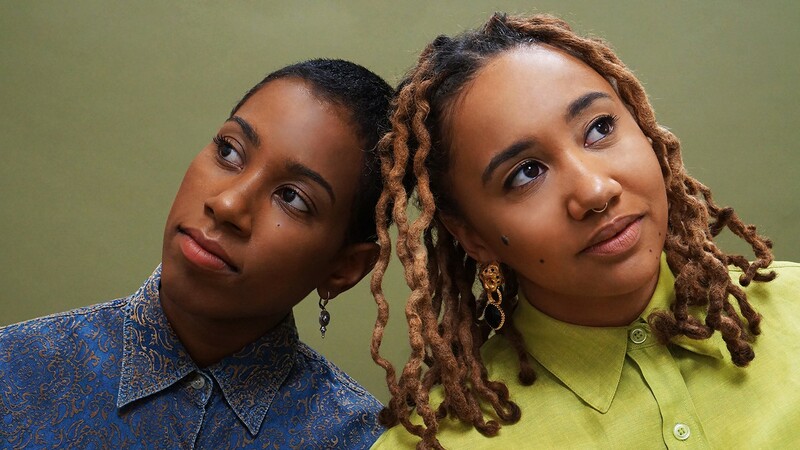 The experimental hip-hop duo hit the ground running, creating a score for "The Right to be Believed," a #MeToo-era aerial dance piece by Flyway Productions; putting on events with BrujaLyfe, an Oakland healing and creative collective founded by Clifford; and assembling a sound that the pair refers to as "goddess trap." Now, the duo is working on a trio of EPs — "Th3 Mind," "Th3 Body," and "Th3 Spirit" — that explore feminine divinity and healing. "You need to heal your mind, body, and spirit," Clifford said. "It's kind of like this three-way concept of how to get free." The first of the three releases, "Th3 Mind," dropped earlier this year. "It's about the mind from the feminine perspective," said Howard. In the EP, Howard coaxes atmospheric beats into surprising and provocative sounds for Clifford's vocals — playful and commanding in equal measure — to skip across. It's easy to see why the duo brands itself as goddess trap. The divine feminine finds its way into each song whether through Clifford's lyricism or through the lushness of Howard's beats. The EP is accompanied by a short video in which Clifford, with all the grace of a high priestess, recites a short poem over beats crafted by Howard, introducing listeners to the world of FR333 and of "Th3 Mind." The duo is currently working on its follow up, "Th3 Body," which explores the feminine psyche as it relates to the body, as well as the trauma that women face and the healing process that follows. While FR333 remains true to its goddess trap roots, the duo moves into new territory with this second EP, which is set for a Dec. 4 release, by exploring funk and electronic sounds à la Peaches. ("We've made some bangers," Clifford said.) Thematically, too, Clifford and Howard hold onto the divine elements that underpin their material while also exploring more terrestrial and corporeal elements of womanhood. While visuals for the duo's music have been sparse, both "Th3 Body" and "Th3 Spirit" are set to be accompanied by similar poem videos to give listeners a taste of what lies ahead. Aside from the trilogy, FR333 has been at work on a number of commissions. Most recently, on Oct. 13, the duo took the stage to close out the Marxathon, a celebration of Karl Marx's 200th birthday put together by the Goethe-Institut in San Francisco, with a set that melded together material from its own EPs with brand new pieces on Marxist-feminism commissioned specifically for the event. It's the constraints that come with commissions that push FR333 toward these projects. "Sometimes, [they] take you to places you wouldn't have gone before," said Howard. "It's different but I like it a lot." At any typical FR333 show, it's not uncommon to see Clifford ask for audience members to groove along with her onstage. The sonic elements are curated very carefully with the intention to soothe, to heal, and ultimately to free. "In future shows, I definitely want to incorporate specific healing frequencies before and after the show," Howard said. "Sometimes, they can be deeper sounds, or sometimes, they can be kind of inspirational sounds, like ritual sounds."